StableComfort is an patented, innovative and shock-absorbing stall mat system that offers the characteristics of natural pasture, allowing your horses to walk, rise and lay down without the fear of slipping. StableComfort has proven results in horses with joint problems by enabling safer and easier movement. 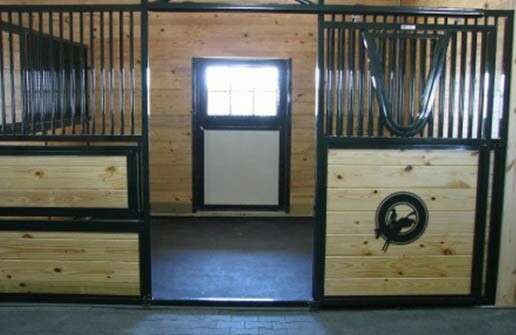 This stall mat system allows your horses to be at their most comfortable while being stalled. Let your horses get the rest they deserve! Call us to make an order or fill out our contact form today. 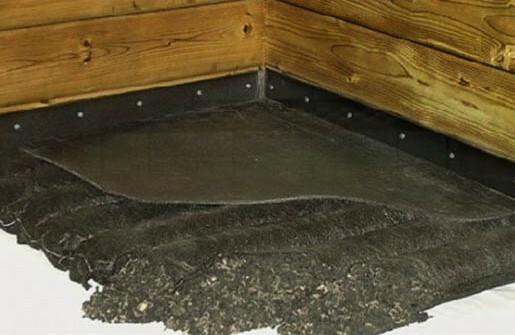 The StableComfort stall matsystem has proven to be the equivalent of about 4-6 inches of wood shavings. This means StableComfort can replace a lot of bedding without reducing comfort for your horse. We have a long list of testimonials we've received from people who have seen noticeable improvements in their animal’s health while being stabled on StableComfort. StableComfort is a two-component mattress system. The first component is a multi-celled mattress filled with uniformly sized rubber crumbs. This rubber crumb provides the mattress with its high level of comfort and its shock absorbency. The second component is the one-piece top cover, made from an industrial strength geo-textile and filled with a vulcanized rubber compound that adds to its durability, making it a non-draining, non-absorbent system. This top cover is fastened to the walls of the stall, ensuring that it stays in place and that no bedding or waste gets underneath the system. 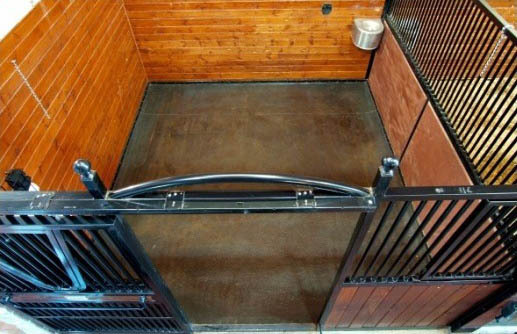 Ultimate Comfort –While standing, this stall mat system provides a supportive, even surface. While lying down, stall flooring decreases the time line of injury rehabilitation and aids in loosening stiff joints. Non-Slip – StableComfort stall flooring provides a non-slip surface, enabling safer and easier movement. 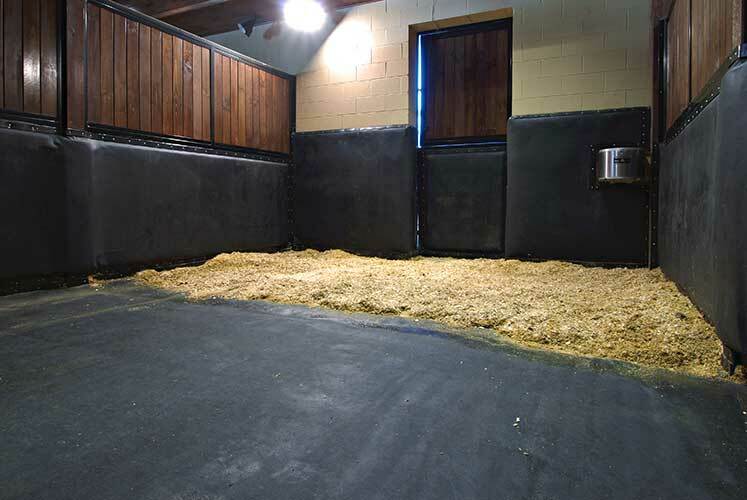 Bedding – The StableComfort stall mat system is the equivalent to 4 to 6 inches (10-15cm) of wood shavings and allows you to reduce bedding usage without sacrificing horse comfort. Labor – Less bedding means less work and costs for you. The wall-to-wall installation of StableComfort stall flooring means dirty bedding stays on top where it can be easily removed. This stall mat system can reduce your manure pile up to 65 percent! 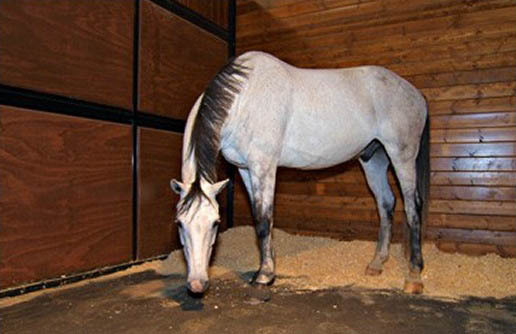 Stall Maintenance – StableComfort stall flooring prevents horses from digging, thereby drastically reducing stall maintenance. 1. What happens to the urine? The urine stays on top of the system, is absorbed into the appropriate amount of bedding and removed from the barn. Research shows that this method delivers the lowest amount of toxic ammonia odors in a barn. 2. Does the urine attack the top cover? No. Promat Inc. has completed private testing through an independent laboratory to be sure that urine does not attack the top cover. 3. What is the cost of one stall? We have multiple dealers across Canada and the United States. Please call or e-mail us for your nearest dealer or to request a personal quote. 4. How do I fasten into various types of walls? Wood – Use wood screws. Concrete/brick – Pre-drill holes into the wall prior to fastening with steel nail-ins or concrete fasteners. Steel – Use steel screws. 5. How long does the product last? Our original stalls are still installed with their original top cover. StableComfort™ is a product that may or may not out live the horse but will definitely make the horse live longer. 6. What is the warranty on this system? There is a 3 year manufacturer’s defect warranty on the entire system, valid from the date of purchase. How Does Stable Comfort Help You Go Green?